SPRINGDALE, Utah — Dramatic landscapes have inspired great art around the world. The unique scenery of America’s national parks, such as Zion National Park located near here, is no exception. National parks and great artists always have a special relationship. Artists have long painted and photographed the beautiful scenery and natural wonders. With the wide publication of early western artists’ works in the 19th century, eastern residents had a chance to see and dream about landscapes beyond the boundaries of their own neighborhoods and towns. These early artists played an important role in the establishment of American first national parks such as Yellowstone and Yosemite. Click on the video at left to see a multimedia video about art in Zion National Park by writer Lorina Liu. In the summer of 1903, the writer and artist Frederick Dellenbaugh approached the foot of Zion’s Great Temple. He was stunned by what he described as “immense prodigality of color.” Dellenbaugh painted more than 20 canvases of Zion Canyon. He also completed an article about Zion that appeared in a popular magazine. Dellenbaugh’s words, “great temple of eternity,” raised awareness about this majestic canyon. Thirty years earlier, Thomas Moran made his first sketch in Zion Canyon. Moran’s legendary paintings led Americans to really see the landscape of the West. Thousands of artists have followed in the footsteps of Thomas Moran. 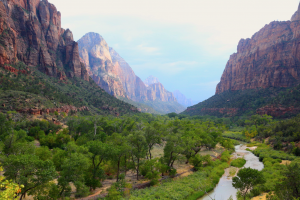 “It was the artists who are able to capture the spirit and the essence of Zion because they are able to share it in color,” said Lyman Hafen, executive director of Zion National Park Foundation. The first photographer who came here were shooting black and white. That’s all they had at the time, but the artists were able to capture colors, interpret the beauty and share majesty of Zion Canyon in their own ways that had not been done before. 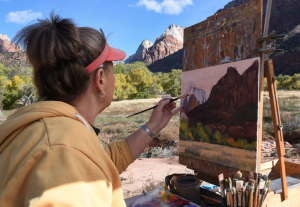 Today, Zion National Park continues to celebrate the role art has been played in the history of this beloved place by encouraging artists to create masterpieces during Plein Air Art Invitational. Plein air painting is about leaving the four walls of your studio behind and experiencing painting and drawing in the landscape. The plein air artists painted at several locations throughout Zion National Park along trails or roadsides to record these remarkable vistas. Many of these locations were the same ones where Frederick Dellenbaugh and Thomas Moran once painted. The strong scent of oil and watercolor paints mixed with the cool Zion canyon air, creates a sweet blend in Zion’s beautiful autumn. As an artist, you continually seek new inspiration to paint something different than others. Whether it is a significant new place, culture, people or feeling, these all help artists to create and grow. Artist Michele Swain paints one of the canyon scenes at Zion National Park (Photo courtesy of the National Park Service). “The quiet beauty and cathedral-like setting have inspired many of my best paintings,” said Michele Swain, an artist from Salt Lake City. Zion National Park is one of Swain’s favorite painting destinations. She has participated in the Zion National Park Plein Air Art Invitational from 2010 through 2016, winning multiple awards as well as the Superintendent’s Award in 2011 and the Foundation Award in 2015. Swain has painted plein air all over the world, from South Pacific islands to the Alps of Switzerland. In two hours of organized, focused effort, she is able to sketch and paint a vivid watercolor. Watching artists at work reveals how they see landscapes, which is sometimes different from those of us who are not artists. However, visitors will experience the power of art and its ability to capture Zion without having to be professional or interested in art to appreciate the event. “If you can get someone to sit down for a demonstration, you’re going to be captivate by them. There’s a connection made,” said Merideth McGrew, a regular visitor from Grand Junction, Colo.
A view of East Zion from the East Rim Trail (Photo by Lorina Liu). Fall is the most beautiful time of the year to visit Zion. The weather is perfect in autumn, not to mention the stunning vistas and magnificent canyons. Desert is not a typical place that may associate with autumn colors, but the blue skies, red rocks and changing leaves of Zion Canyon are more like splendid fireworks, which becomes the mixture of pigments on artists’ canvas. Art has a very firm place in the history of Zion Canyon that led it to become a national park. In the first week of November each year, artists, donors, sponsors and visitors continue that rich tradition in Zion National Park. Zion has hosted a Plein Air Art Invitational for nearly 10 years. A total of 24 artists are invited to paint in the park every year. They give daily talks and demonstrations while you can spot them on the hiking trails with their easels and paintbrushes. When: The first full week of November each year. Visit www.zionpark.org for the full schedule. Where: Inside Zion National Park. Demonstrations will be held on the patio of the Zion Human History Museum. Lectures will be held in the Zion Lodge auditorium and Canyon Community Center. Cost: Artist lectures and demonstrations are free. Park entry fees apply.